"What is Melbourne for You?" There is no doubt that Melbourne, Australia is a happening and exciting place to be. It has something special and is growing steadily as a world-class city that can hold its own amongst other international favourites. Melbourne has been listed as one of the world's most liveable cities for quite some time. It is changing at such a rapid pace that the Melbourne of 20 years ago is barely recognisable. Melbourne is young, alive, entertaining, and constantly changing. What we love - and this distinguishes from other places we have lived - is the passion and enthusiasm with which Melburnians pursue their particular niche and passion, whatever it happens to be. We embrace our activities with such fervour - in the arts, music, fashion, design, sports or a long line of cultural festivals. We LOVE our city and this is contagious. It is what gives this city presence, depth and soul - a real genuine trait. We are no longer at the end of the world trying to catch up to the cities overseas, but we have something cutting edge and with style. Melbourne is friendly and beautiful - with art on street corners, tree-lined boulevards and parklands that extend right into the heart of the city, and a unique tram system that makes it so easy to get around. However, you won't be able to absorb its life in a quick glance by walking its main streets or riding a tram. You will enjoy the aesthetics of the cityscape, but you may miss the Melbourne charm entirely. To know this city, you need to immerse yourself in one of its unique facets. It has many subcultures, personalities and styles, and it is these layers and specifics that make it so interesting. Melbourne has a vibrant arts and music scene, live music venues, markets, designers, community activities, eccentric Cafes, cobbled laneways, quirky shops, intimate bars and restaurants, festivals, activities and events. With the real Melbourne life taking place in the city's many crannies and niches, connecting with it may not necessarily be that obvious, yet it is these specific experiences that will give you the Melbourne feel. The thing is, as much as you might like to explore a particular area or subculture, you need to know where to start. For this reason we have dedicated this website to the task of giving you information that will help you have a great time and provide your with a door into the exciting world of Melbourne. Our city is changing and evolving, with events and even places of interest coming and going. To stay in touch with what is happening, please sign up to our free Newsletter or the Melbourne Blog. That way you will find out when we are featuring a new place or experience, and what the latest things to do in Melbourne are. Your car rental Melbourne Australia options are numerous. Get discounted rates for major car rental companies, such as Thrifty, Budget, Europcar, Hertz, Avis and Britz, or local Melbourne car hire. Melbourne transport is fairly well organised, especially with its extensive tram system and bike paths. This guide will help you decide on one of many the options for your travel around Melbourne. From Melbourne you can enjoy a great many Melbourne tours and day trips. There is everything from Yarra valley wine tours, to the Great Ocean Rd, relaxation, luxury, penguins and wilderness. Here are Melbourne tourist attractions that will give you a good sense of Melbourne, from the Yarra to historical attractions, to city laneways and cafés, to observation decks. Many Kids activities Melbourne are fun, cheap and accessible. There are free kids activities and favourite family activities, from a childrens garden, to a farm, railway, to zoos, day trips and more. There is a Melbourne zoo for everyone. First, there is the original Royal Melbourne Zoo, second the Healesville Sanctuary for Australian animals, and last, you can go on Safari at Werribee Zoo. Melbourne culture is alive. Art and music events are part of life in lanes, bars and cafes, festivals, exhibitions and galleries. The Melbourne style is sophisticated, playful and multi-cultural. Find out whats on in Melbourne throughout the year, in the Arts, Sports, Exhibitions and Melbourne Events. There are always things to do that make Melbourne a very exciting place to be and experience. When it comes to Melbourne shopping, you will find everything from high end fashion to original creations, from vintage clothing to book stores, design and art, each with unique character and style. 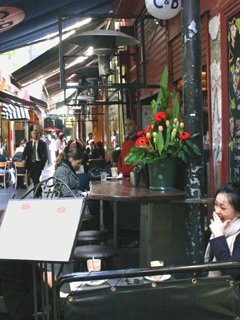 Good food, footpath dinging and eating out in Melbourne restaurants contributes hugely to Melbournes charm from intimate eateries, to multicultural cuisine, to world famous restaurant dining. There is a large variety of Melbourne Australia hotels. Find the best Melbourne hotel deals whether you want to stay in a cheap hotel, in a more intimate Boutique hotel or a luxurious 5 Star hotel. Finding a cheap hotel Melbourne can be easy or not so easy, depending on when you want to stay in Melbourne. Find out how to get the best rates for your Melbourne hotels at any time of the year. The vibrant character of the Melbourne suburbs and precincts makes Melbourne one of the most liveable cities in the world. Like New York, London and Paris, it is made of colourfully diverse precincts. The weather Melbourne Australia is famous for, is to be unpredictable and for its four seasons in one day. The Melbourne weather is actually very livable. Here is some information. Whether you are travelling or wanting to work, a visa Australia is necessary. There are various types of Australia Visa depending on whether you are a visitor, skilled migrant or business person. Real Estate Melbourne is booming, especially around the inner city. Residential and commercial real estate continue to be a great investment. In this market locating the right property can be tricky. The Melbourne Blog will keep you up-to-date with We-Love-Melbourne.net, so you can stay in touch. Subscribe here! Melbourne news find out what is happening in Melbourne, whats on in Melbouren, events and festivals. If you have questions or if you would like to contact me in Melbourne, you can use the secure form on this page. I will respond to genuine inquiries and am interested in your feedback. There are many things to do in Melbourne that will keep feel alive and engaged, and keep you fit. From golf, to hot air balloon rides, to bike tours, to beaches and extreme adrenalin experiences.